My motive in cooking has always been to create something extraordinary, something that thrills and delights the palate. When I'm working within a set of guidelines — such as low fat, gluten-free, or nondairy — I regard these parameters as challenges, never as any sort of goal. My objective is clear and consistent: to transform something I absolutely must have (food) into something I deeply appreciate (deliciously satisfying food). Part of that goal is to also ensure that the food is at least vaguely healthful, so it doesn't come back to haunt my pleasure with ugly consequences. He also says that he created the recipes to please his own non-vegan palate, and he believes this is a good thing, as the recipes may help to persuade non-vegans who sample the dishes, that vegan food is delicious. * This may be a good thing for new vegans and non-vegans, but long-time vegans whose palates have adjusted to a plant-based diet, may find some of the food over-salted. This is not to say the recipes aren't great — the ones we tried were wonderful — but we had to greatly reduce the salt. Don't let what I've just said dissuade you from buying the book — it's packed with inspired ideas for creating fast, gourmet food that will surprise you with its flavor and beauty. There are so many intriguing recipes in the book that I want to try, I'm sure I'll be cooking from it regularly, but with discretion, as far as the salt content goes. The recipes, though speedy and easy enough for the average cook, are based on whole foods, not packaged stuff, in case you were wondering. Building an assortment of good cooking tools can seem daunting. The book begins with excellent suggestions for selecting kitchen equipment, from "must have" to "hard to live without" to "makes work more fun if you have," so you can build a workable collection as finances and fancy dictate. Many people in transition to a plant-based diet wonder what to stock in their pantry, and the second chapter addresses the question with a comprehensive list of ingredients, and an interesting descriptive paragraph about each one. The first recipe chapter, called Jump Starts, contains recipes for flavor enhancing condiments to make and have on hand — stuff like garlic oil, chipotle chile purée and balsamic vinaigrette, which will add fast, deep flavor to your cooking. The first dish we tried was white bean soup with Tuscan kale. My husband made it, and it took him about 30 minutes, though the soup tasted like it had been simmering for hours. It would have been fabulous if it hadn't been so incredibly salty. I could taste the flavors under the salt but I could barely eat one bowl. The recipe serves four to six, but contains three bouillon cubes plus a teaspoon of additional salt. (My husband didn't add the extra salt, or I wouldn't have been able to eat the soup.) To give you some perspective, my husband used Rapunzel vegan vegetable bouillon, which contains 1030mg of sodium per serving (that's 43% of the daily sodium for a 2000 calorie diet). Each cube is considered two servings (2060mg), and the soup contained three cubes, or six servings. One teaspoon of salt contains 2400mg of sodium. That's a big hit of sodium. (More thoughts on sodium, here. Most Americans get too much sodium in their diet, and it's not a bad idea to teach our palates to appreciate the inherent, delicious flavors of whole foods.) It's entirely possible that the author used a lower salt bouillon than we did, but be aware of the sodium content of any bouillon cube you choose. And add extra salt carefully. The second recipe we tested was red quinoa with zucchini and corn. Once again, we were rewarded with an easy-to-prepare, delicious dish filled with flavor and color. (We left out the bouillon and reduced the salt by more than half. And we used regular quinoa.) 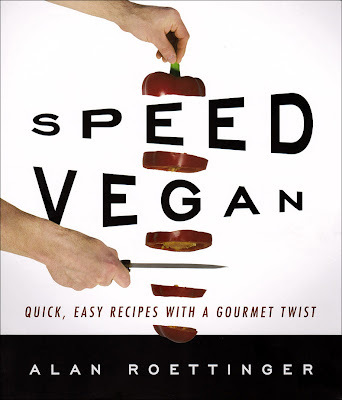 There are so many fabulous-sounding recipes in "Speed Vegan," I can't wait to try more of them. Pulse the onion, carrot, celery and garlic in a food processor until very finely chopped. Put the oil in a large soup pot over medium high heat. Add the onion mixture, stirring well. Cook, stirring often to prevent sticking and burning, for about three minutes. Add the boiling water, bouillon cubes and salt. Bring to a boil, decrease the heat, and simmer for about 15 minutes, or until the kale is tender. Add the beans and simmer until heated through. Taste and adjust seasonings. If you detect a bitter edge, add the agave nectar. Remove from the heat and stir in parsley. Serve at once. Heat the oil in a medium pot. Add the onion and cook and stir until it begins to soften. Add the zucchini and garlic, and cook and stir for two minutes. Add the corn and quinoa, and stir to mix thoroughly. Add the carrot juice, salt and bouillon cube, and bring to a boil. Decrease the heat, cover, and cook for 15 to 20 minutes, until quinoa is tender. Stir in the cilantro and serve at once. * Interestingly enough, Alan Rottinger convinced himself to try a vegan diet. There's a note in the introduction saying that since writing "Speed Vegan," he has adopted a plant-based diet, and is happily thriving on it. You can read his blog here. There are lots of terrific recipes there. Visit the Book Publishing Company Web site for a chance to win a copy of "Speed Vegan" and other vegan cookbooks. Full disclosure: Speed Vegan was sent to me without cost by Book Publishing Company. They did not try to influence my review. UPDATE, 3-27-11: I just attended a cooking demo at Vegfest with Alan Roettinger and, coincidentally, he made red quinoa with zucchini and corn. When he added the bouillon, he said he was using Rapunzel brand NO SALT bouillon cubes. That would make for a much less salty result than we had! If you're anywhere near the Seattle area this weekend be sure to visit Vegfest at the Seattle Center exhibition Hall. 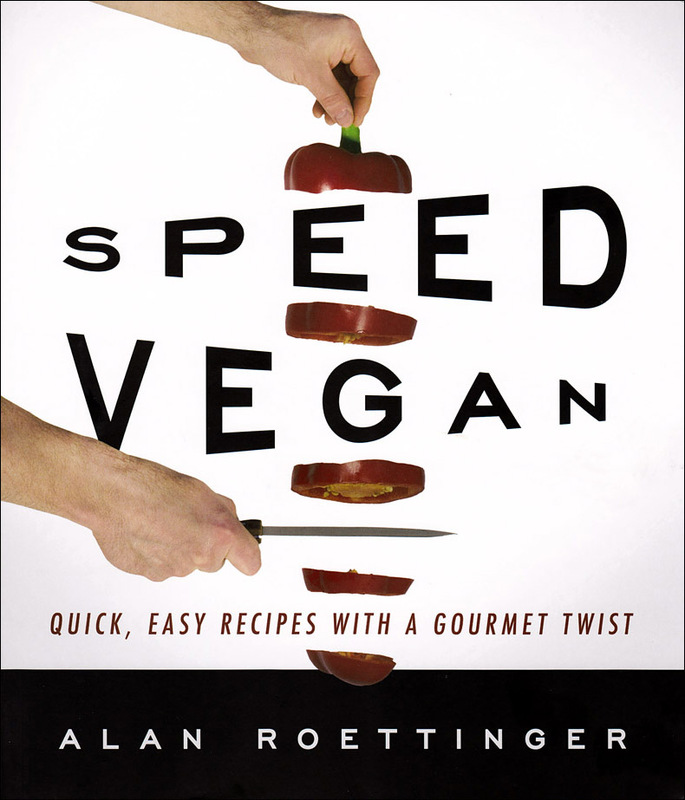 It just so happens that Alan Roettinger, author of "Speed Vegan," will be doing cooking demos on both days. I'll be volunteering as a food demonstrator on Sunday from 10 to 2, so if you think you recognize me (:D) be sure to say hello. By now, most people have probably heard about the Web-based companies like Groupon, that send you daily deals for half-price entertainment, meals and services. 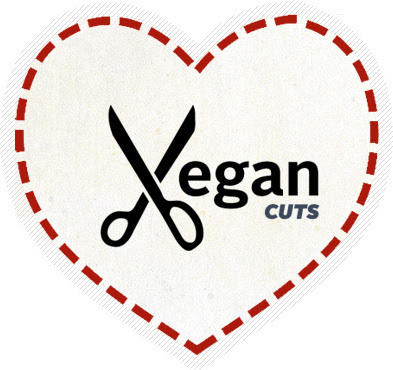 The intrepid Vegan Backpackers are busy establishing a vegan deal program, and looking to sign people up to receive bargains on products and services of particular interest to vegans. Check it out by clicking on the heart! I rarely buy desserts like cookies, cakes or pies. In fact, I really can't remember ever buying an entire pie or cake. I'm not a big fan of very rich or sweet foods. If I need/want a dessert, I make one. I don't like to have sweets around the house, and I don't get a lot of cravings for them. Baking the treats is actually more appealing to me me than eating them. Though if in the right mood, and hungry, I might eat some vegan cookies, if they happened to appear. That's what happened recently when my husband returned from a trip to Whole Foods with a very small package of Skydottir Epic Cookies. There were three, petite but thick, cookies in the box and I was really hungry. The cookies were gluten-free, vegan, local, and handmade with all manner of organic this and that. Even I wanted to eat them on the spot. As I began to tear open the package, my husband got a strange, stricken look on his face which prompted me to stop ripping and ask what was wrong. "Aren't you going to take a picture and post it on your blog?" Well, no, I wasn't planning to — I was just going to eat them. Then he told me the story of how Alison Dahmen, the owner and baker behind Skydottir Cookies was handing out free samples at whole Foods, and he got to talk to her about her business. She quit her day job, rented kitchen space, and was trying to make a go of her cookie business, with outlets all over Seattle and delivery to the state through her Etsy shop, so he bought a pack of cookies to bring home. I was guilt-tricked, and reluctantly spread the cookies onto my cutting mat for a quick shoot, after which I quickly ate two. I loved them, and would buy them again if a cookie urge struck and I couldn't bake. They are a little pricey, but perfectly delicious chocolate chip cookies that absolutely taste home-made. The organic flour mix contains brown rice flour, quinoa flour, tapioca flour and coconut flour, and the main sweetener is coconut palm sugar. While we're on the subject of bakery sweets, I might as well tell you that I popped into a brand new neighborhood vegan bakery to see what was what. What I found at Jodee's Fresh and Organic Desserts, was a case filled with gorgeous pies that were not only vegan and organic, but were also raw and gluten-free. Jodee is a graduate of The Living Light Institute. I stared at the pie case for a long while, paralyzed by too many choices of things I don't normally eat. I chose a slice of tiramisu, described by my attentive sales person as "light and refreshing." I've never had real tiramisu, so I have no old memories to which to compare this fragrant cloud of young-coconut-based confection. To me, it tasted like chocolate coconut cream pie. It was outrageously smooth and creamy, and not overly sweet — a very pleasant eating experience. Remember, I said I'm not a big consumer of rich desserts — it took three days for my husband and me to eat this not-so-big slice. I had one or two forkfuls each day, and that was all I wanted. (No judging, please.) It was delicious and creamy, but raw desserts can be so filling with all the coconut and nuts, I have definite limits to how much I can consume. Truthfully, I prefer fruit-based raw desserts, and may try one of the fruit pies next time I get the urge to visit the bakery. Jodee's Desserts offers many delicious organic choices, including wheat-free, gluten-free, dairy-free, low-glycemic desserts, made from scratch with fresh, quality ingredients. We also have fresh fruit and vegetable smoothies, organic french press coffee and organic cold-brewed coffee blended drinks. Our treats deliver all of the flavor and none of the guilt to keep you and our community healthy and happy. Bitt, from Bitt of Raw, did a terrific review of Jodee's Bakery on her blog. Since Bitt eats a mostly raw food diet, she's probably a better judge than I am of a raw bakery. Correction: I just remembered we ordered a whole vegan cake to celebrate the birth of our third son. There were quite a few people at the birth but it would take too many words to explain. I remember the bakery asking me what day I would need the cake, and trying to explain that we didn't know what day the baby would be born. We went ahead and ordered the cake, and it all worked out perfectly in the end. Special Announcement: We'll be doing a feature on one of our favorite new organizations, Vegan Protest Fuel, in the upcoming issue, but we're sending out this special message because VPF's mission is time-critical. VPF delivers food to protesters, exposing others interested in social justice issues to veganism. Currently, they are feeding protesters in WI, and they have the capacity to bring this sort of vegan food activism to other locations across the country. They rely on donations and if you would like to donate, please visit them at http://veganprotestfuel.com/. I appreciate the challenge people face when they invite a vegan to dinner, and they're not used to cooking without animal products, so I don't flinch (much) when faced with the culinary challenges posed by my guests. Recently, I welcomed a guest who eats no onions, no legumes, no no spices, and very few vegetables. I love her so I did my best to accommodate, while still providing food choices the other spice-loving, vegetable devouring guests would enjoy. The guest of honor requested pasta, so I made a warm pasta dish using quinoa pasta. The dish contained halved grape tomatoes, zucchini spears, sliced mushrooms, kalamata olives, garlic, fresh basil, Italian parsley, toasted walnuts, olive oil, and a touch of coarse sea salt. The veggies were lightly cooked and large enough to be easily picked out if necessary. I had also planned to include browned tofu in a small dice, but completely forgot about it. Along with a big green salad brought by one of the other guests, she had a complete meal that she could eat. We also had a platter of roasted vegetables with carrots, sweet potatoes, eggplant, turnip, celariac and brussels sprouts — something for everyone — and a warm lima bean salad. I recently read that lima beans are good for your bones, so I disregarded the fact that I've never been fond of limas, and used them in a dish. Now I think that lima beans taste good! I made the pasta and lima beans the way I often do, by first thinking about how I wanted the final dish to taste, then deciding what ingredients were needed to get the taste I was after. Then I wrote down a list of ingredients so I wouldn't forget them. I did manage to forget the tofu for the pasta, but usually this cooking plan works well for me — except when I want to reproduce a recipe. I have a pretty good idea what was in the lima beans so a recipe of sorts for that dish will appear below. For dessert we had another golden cake, since I'm still experimenting with pan sizes and frosting ingredients. I used an 8x3-inch straight-sided pan, and it was about 1-inch too high. Now I think an 8x2-inch would be perfect and I'm kind of worried I'm going to own every pan size available before I'm done! Is there a cure for cake pan addiction? The amounts in this recipe are flexible and open to interpretation. Cook the lima beans in your preferred way. You can simmer them in a large, covered pot until they are tender, or cook them in a pressure cooker. The pot will take about two hours, and the pressure cooker will take five to seven minutes. You could also buy them already cooked, in a can. (two to three cans) If you cook the beans, save the cooking liquid to use as soup stock. Make the dressing by mixing together the lemon juice, mustard and sugar. In a large skillet or wok, steam the garlic, carrots, corn, peas and artichokes in about 1/4 cup of water until the carrots are bright orange and a little tender, and the frozen veggies are cooked, about three to five minutes. Add more water if needed but aim to have all the water evaporate. Add the drained beans and cumin. Cook until beans are warm. Turn off the heat and mix in the onions, parsley, and dressing. My husband and I just attended a vegetarian Thai cooking class at our local food co-op, PCC Natural Markets. (PCC stands for Puget Consumers Co-op. Started in 1953 as a food-buying club of 15 families, today it is the largest consumer-owned natural food cooperative in the US, with about 40,000 members.) The class started at 11 a.m., and I didn't eat anything before I went, which turned out to be a good thing, as there was much fabulous food to consume. The class was taught by Pranee Halvorsen, who first learned to cook in her mother's kitchen in Phuket, Thailand. She started with Tom Kha Ja, or Coconut-Ginger Vegetable Soup, and she gave me permission to print her recipe. The soup, according to Pranee, was about two stars in the heat category — it was a little spicy, but perfect for me. The next dish was Gaeng Pa, or Jungle Curry with Mixed Vegetables. This dish was rated about four or five stars on the heat scale because Pranee was trying to give us an example of what traditional Thai food would taste like, and also demonstrating the cleansing properties of red chili flakes and black pepper. After one bite, I started to sweat (I mean cleanse) and by the time I was finished, it seemed like my inner ears were burning a little. There were some members of the class who needed a shot of coconut milk added to their food so they could finish it, but not me. I admit it may have been a tad too spicy, but not so hot that I didn't enjoy it. Looking around the room, though, my classmates looked like they had just gone for a run, or eaten a small plate of fire — flushed faces, damp hairlines, steam rising from collars. While I can't pass along the recipe for the curry, I did find a recipe for Gaeng Pa Curry Paste on Pranee's blog, if you want to try your hand at creating a curry dish. The blog isn't vegetarian, but the recipes can be adapted. For example, the curry paste on the blog uses shrimp paste, but in class she used white miso. She also added oil to create the paste rather than water, and said the oil preserves the paste and makes it easily freezable, if you want to make a large quantity. She used a spice mill to grind the peppercorns before adding to the curry paste. The last dish from our class was Phad Thai. We learned the correct way to prepare rice noodles so they would be al dente in the final dish, and we learned how to make a phad Thai sauce with western ingredients that closely approximates the flavor of a traditional Thai sauce. Pranee has quite a few Youtube cooking-related videos and I've chosen two to present here. The first is a tutorial on how to prepare lemongrass for use in recipes. First she shows how to prepare it for recipes where it will be ground into a paste, then how to cut it for use in stir-fries, and finally how to prepare it to use in making soup, where it will be removed when the soup is finished. She used the last method when she made Tom Ka Ja in class. The second video shows how coconut palm sugar is made. In my last two posts I highlighted jaggery, which can be made from various sources of raw sweet nectar. Here you can see where coconut palm sugar comes from and exactly how it's made in Thailand. This is the sugar that would be used in traditional Thai cooking, though you can substitute evaporated cane juice or another type of palm sugar. Heat a wok and add 3 tablespoons of oil. Fry tofu until all sides have a golden crust. Remove tofu and set aside. In the same wok with the remaining 2 tablespoons of oil, sauté carrot, onion and mushrooms for 3 to 5 minutes until translucent and fragrant. Add all the vegetables and tofu to a large pot with 3 cups of water and bring to a boil. When boiling, stir in chile peppers, lemongrass, ginger, lime leaves or peel, and shallots. Let boil for 5 minutes, then add zucchini, corn and jalapeño, and cook for 2 minutes. Stir in salt (to taste), coconut milk and lime juice. Remove the lemongrass with tongs. To serve the soup, place tofu equally into 6 soup bowls, then garnish with cilantro and coconut cream. *In class, when Pranee smashed herbs and vegetables to release their oils, she did it with the bottom of a small metal pot. She also passed along some of her secrets for authentic Thai cooking, like adding herbs and salt at the end of cooking, and always adding herbs to very hot food to better extract their oils. 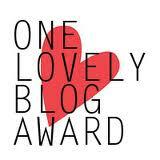 A few weeks ago I was kindly awarded a blog honor by Raw Girl, writer of the beautiful blog Rawk Me! Raw Girl is a writer and food blogger living in Mumbai, India, and if you're not already familiar with her tempting food and great photos, pay her a visit. I'm supposed to link back to the award-giver, share seven things about myself, and pass the award on to 15 newly discovered bloggers. I've had a lot on my mind lately, and have been kind of slacking in the blog-writing, blog-reading area of my life, and I think I'm going to take a pass on writing more about me at the moment. I've got responses to other awards posted on the about me page of this blog, and I'm not feeling quite up to adding anything new right now. Please forgive me if I sound cranky. As for passing the award on, I'm selecting eight blogs I've relatively recently discovered. Check them out, and I think you'll agree they deserve to be awarded!